Ward boundaries had been re-drawn in Huntingdonshire meaning that it was an all out election rather than the one-third election that is usual here. But that is about to change as Huntingdonshire changes to and election cycle that see the whole council elected once every four years. At the start of that process, the Conservatives saw their number fall by two with gains for Labour and the Liberal Democrats. Huntingdonshire was one of the areas where the rise in UKIP started by the party lost it last three remaining seats here. Huntingdonshire has been a Conservative council since 1976 - the longest run of any council in the Anglia region. A library book from a school in Cambridgeshire was returned from Australia almost 30 years late. Fantasy novel Shardick, by Richard Williams arrived at Kimbolton School, Huntingdonshire on January 9. The book had been borrowed in July 1989. It was sent from Western Australia via airmail with an anonymous note saying: "Overdue library book (Junior Library) being returned, thank you." Sue Hart, the library's resource manager, said: "We are keen to find the sender and thank them for their honesty - with all overdue fines waived." 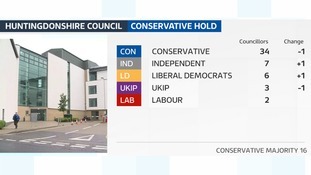 The Conservatives have held Huntingdonshire council. Credit: ITV News Anglia. 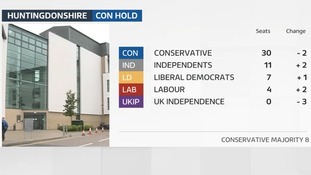 Gains by the Liberal Democrats and independents were not enough to take Huntingdonshire council from the Tories. The Conservatives's majority was slightly reduced - to 16 - while UKIP also made losses. The centre of Huntingdon has been evacuated after reports of a suspicious package left at a bank. A police cordon has been set up on the High Street, and shoppers asked to leave buildings and shops in the town centre. The bomb squad have been called in to investigate the package, at the Santander Bank. Are you the lottery millionaire in East Anglia who hasn't yet claimed their prize? The National Lottery is on the hunt for the holder of a £1 million raffle ticket that is yet to be claimed. The winning ticket was bought in the Huntingdonshire area on 23 March 2016. "We’re eager to find the mystery ticket-holder and unite them with their winnings – this amazing prize could really make a huge difference to somebody’s life. “Try checking in the pockets of clothing, in wallets, bags and down the back of the sofa – someone out there could literally be sitting on a fortune!" This prize follows hot on the heels of another £1m Lotto Millionaire Raffle prize that recently expired and was bought in the same area. A £1,000,000 Millionaire Raffle prize from the 10 October, 2015 has remained unclaimed more than 180 days after the draw took place. UKIP have made a couple of gains in Huntingdonshire but it failed to dent the Conservative's comfortable majority on the council. It has been a Conservative council since 1976 - the longest run of any council in the Anglia region. Fire crews were called to a lorry fire on the A1 in Cambridgeshire overnight. An articulated lorry carrying plastic and rubber material burst into flames between Alconbury and Sawtry. Cambridgeshire fire said the blaze was caused by an electrical fault. Two US Airforce bases in our region have today been officially given the freedom of the district of Huntingdonshire. The Conservatives have lost 2 seats on Huntingdonshire District Council, but remain in total overall control with 39 seats. Labour, Ukip and Independents all gained 1 seat. The Lib Dems lost 1 seat.